A traditional Sweet Vegan Braided Holiday Bread made at Easter time without any eggs! 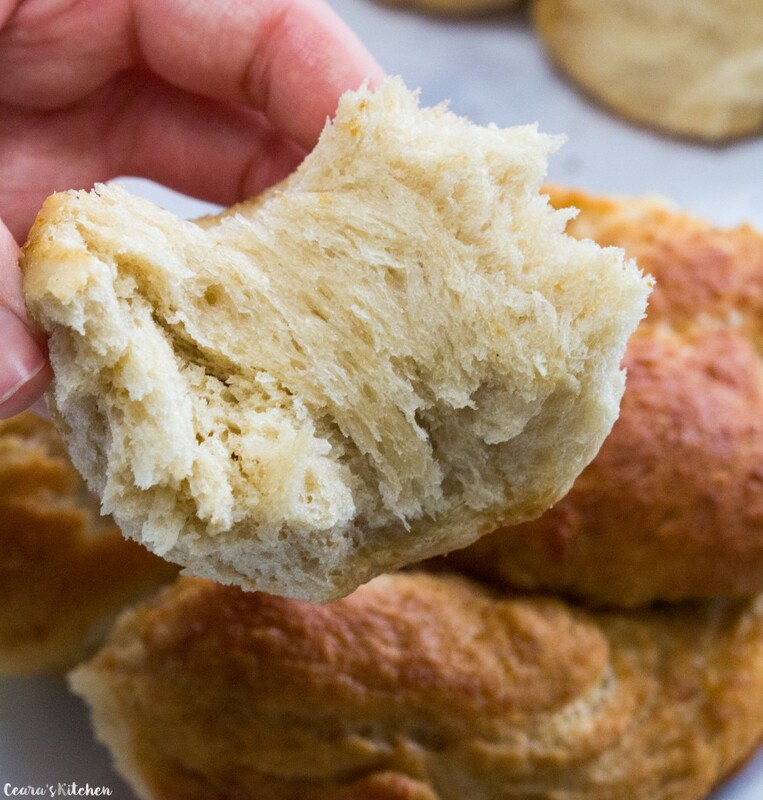 This Egg Free Bread is easy to make at home and bake in the morning to eat fresh and warm for holiday brunches! Serve with jam, nut butters or by itself. Hello from Barbados guys! How is your Easter weekend going? Any fun plans!? What are you serving for your Easter meal? We are enjoying the sun, beach and everything this wonderful island has to offer for the long weekend. It’s nice to get away and just time some quality time with loved ones to relax. We are staying close to the water and I could definitely get used to waking up and seeing the ocean everyday. 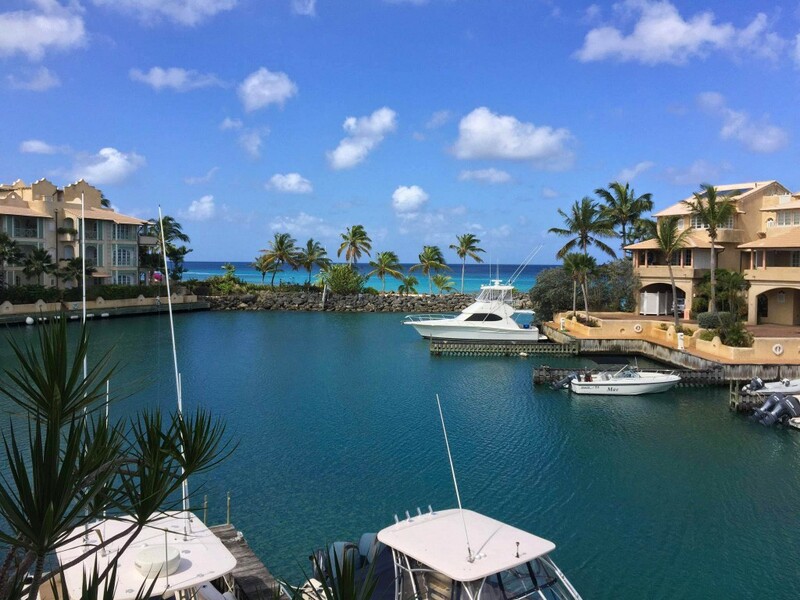 Barbados is simply gorgeous – if you haven’t been, I would definitively recommend a visit. Let’s talk about this Vegan Braided Holiday Bread. 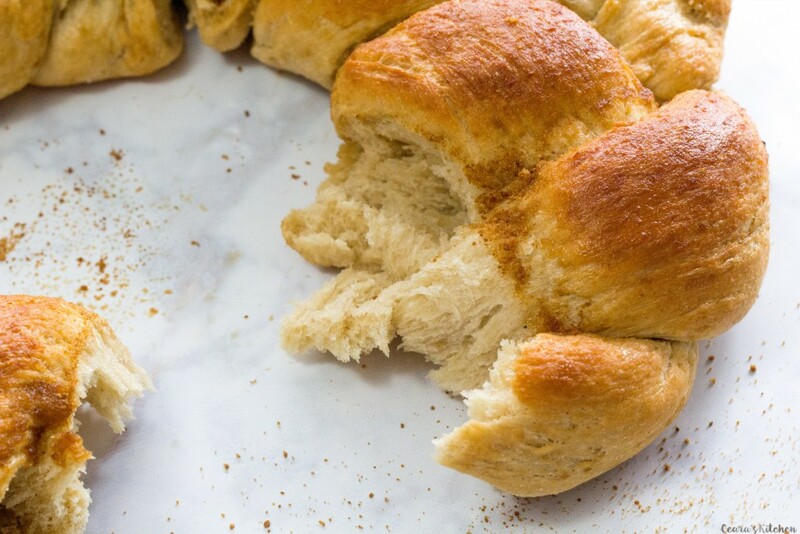 Sweet Easter Bread (also known as Challah Bread) is a tradition in my family to make for Sunday morning Easter brunch. When I was living in Belgium, I also saw something similar to this Sweet Egg Bread being sold in the bakeries around the holidays. Traditionally, Braided Holiday Bread is made with a lot of eggs. 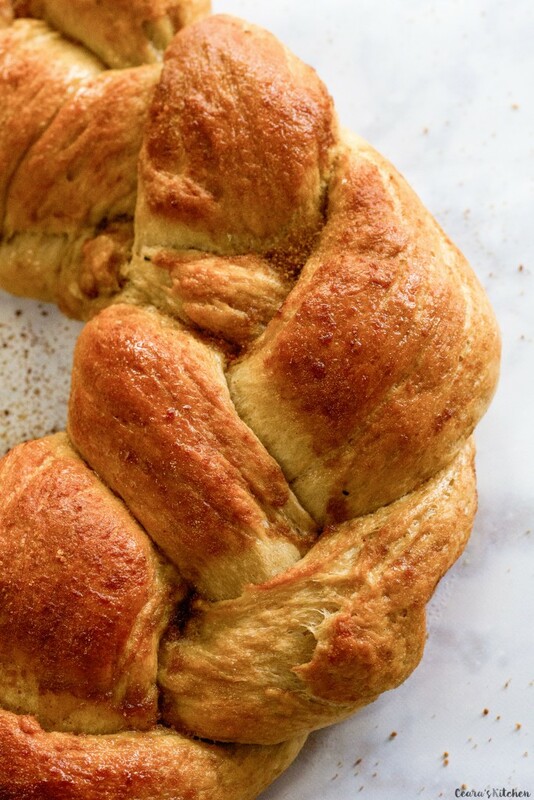 By fluke, I was experimenting last weekend with making cinnamon buns and I knew the soft and tender dough would be just perfect for a Egg Free Challah Bread! 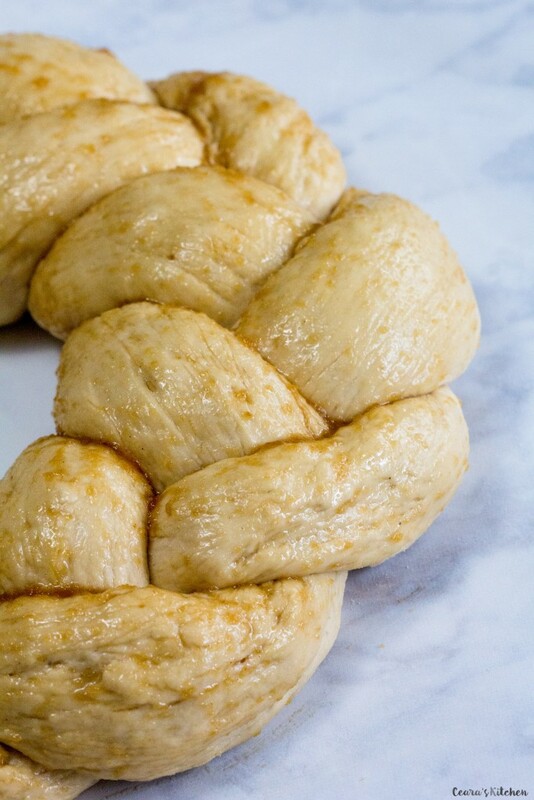 This Vegan Braided Holiday Bread is simple to make and made with only a few ingredients. You can even make the dough the night before and braid and bake it on Easter morning. Start by first mixing the dough. Once the dough is ready for kneading it will look like this. Notice how the dough is still a little bit sticky and beginning to separate from the sides. 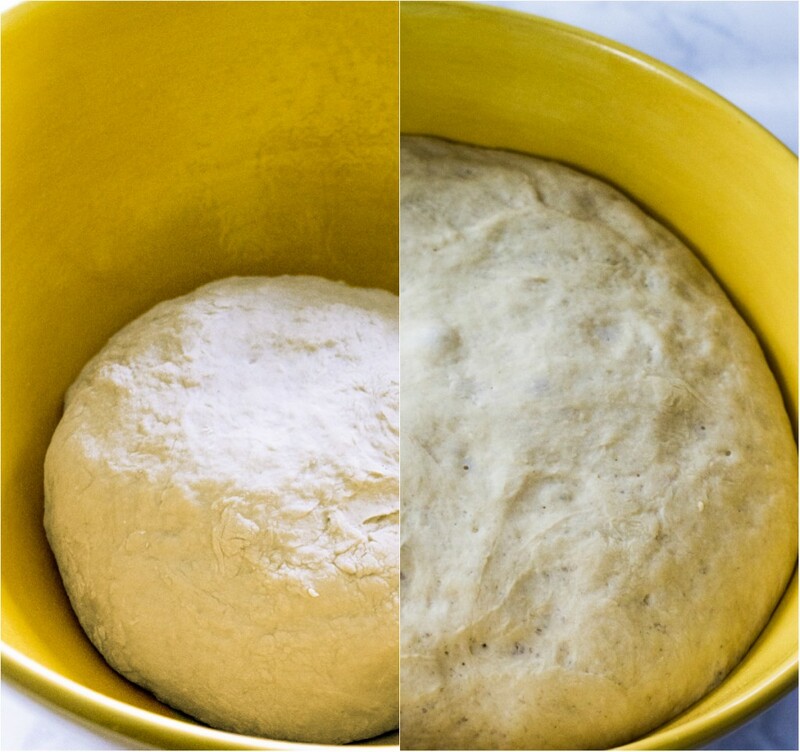 Place the dough in a bowl and leave to rise for an hour in a warm, tuned off oven (or overnight in the fridge). The dough will triple in size once it is ready to be braided! 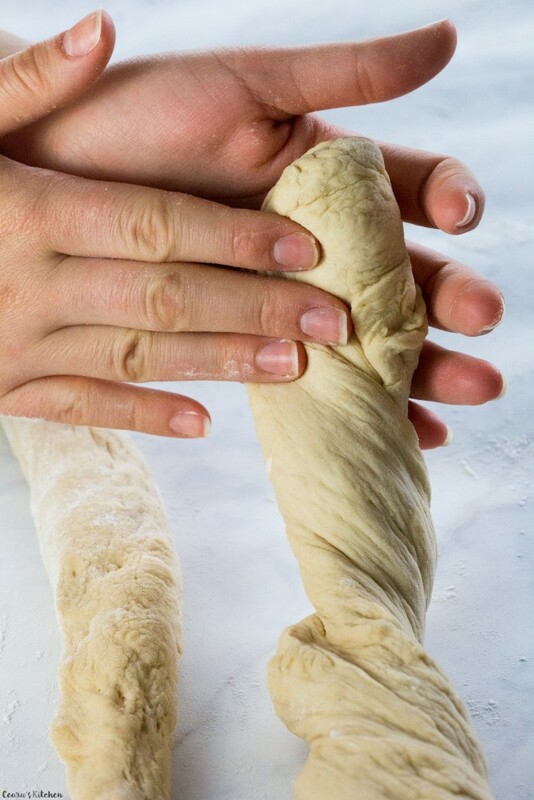 Roll and stretch the dough with your hands until you have three long pieces of dough. This dough is super tender, soft and easy to work with! And bake until golden brown. Sprinkle with some coconut sugar for good measure. Nothing beats the smell of fresh bread baking on holiday mornings. I mean look at how perfectly fluffy, flaky and soft this Vegan Braided Holiday Bread is without ANY eggs! If you guys do make this Vegan Braided Holiday Bread at home, share your feedback below, snap a photo and tag me #CearasKitchen on Instagram! Have a wonderful Easter holiday everyone! A traditional Sweet Braided Holiday Bread made at Easter time without any eggs! This yeast bread is easy to make at home and bake in the morning to eat fresh and warm for holiday brunches! Serve with jam, nut butters or by itself. [b]Proof the yeast:[/b] Warm the milk up in a small bowl in the microwave by 15 second increments (or in a pot on the stove-top) until slightly warm to touch. You do not need to use a thermometer, place you finger in the milk and it is ready once it feels like a similar temperature to bath water. Do not overheat the milk or it will kill the yeast! Add the warm milk to your mixer with the dough attachment. Add the yeast and teaspoon of sugar to the milk. Turn the mixer on low and mix the yeast until it is just combined (one or two mixes). Cover mixer with a dish towel and leave for 5 to 10 minutes until the milk begins to foam – this means your yeast is active. 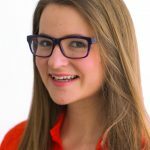 If your yeast does not foam, repeat from step 1 with new yeast. Your yeast has to be active for the bread to rise!! [b]Combine dough: [/b]Add applesauce and sea salt to the foamy milk mixture. Mix on low. Add the first 1 1/2 cups of flour, mixing on low and scraping down the sides when necessary until just combined. By the half cup, add the rest of the flour until combined. You will know the dough is mixed enough because it will separate from the sides (see photos). [b]Knead:[/b] If you are using a [url href=”http://amzn.to/2mShIos” target=”_blank” rel=”nofollow”]KitchenAid stand mixer[/url], continue to mix on high until you have a soft and pliable dough that forms into a ball. [u]If you are not using a stand mixer[/u], lightly dust a clean counter-top with flour as well as your hands (this will make the dough stick less to your hands as you knead it). Place the dough on top of the counter and knead for 10 minutes until smooth and silky to touch. The dough should be soft and pliable when ready. Smack the dough down on the counter a few times to release any air in the dough. [b]Rise: [/b]Preheat your oven to 200F/95C. Turn the oven off and turn the light of the stove on. This creates the ideal temperature for your dough to rise. Spray a large bowl with non-stick cooking spray. Place the dough in the bowl and cover with a clean and slightly damp dish towel. Place the dough in the turned off oven with the door [u]slightly ajar[/u] for 1 hour until the dough has tripled in size. Take the bowl out of the oven and punch the dough a few times to deflate it. [b]Braid the dough:[/b] Lightly dust clean counter-top with flour and cut the dough into three equal pieces. Pick up one of the balls of dough. Roll and stretch the dough between your hands until the dough is about 20 inches long (50 cm) and 1 1/2 inches thick (3.8 cm). Repeat this with the other two balls of dough. Place the three long pieces of dough beside each other. 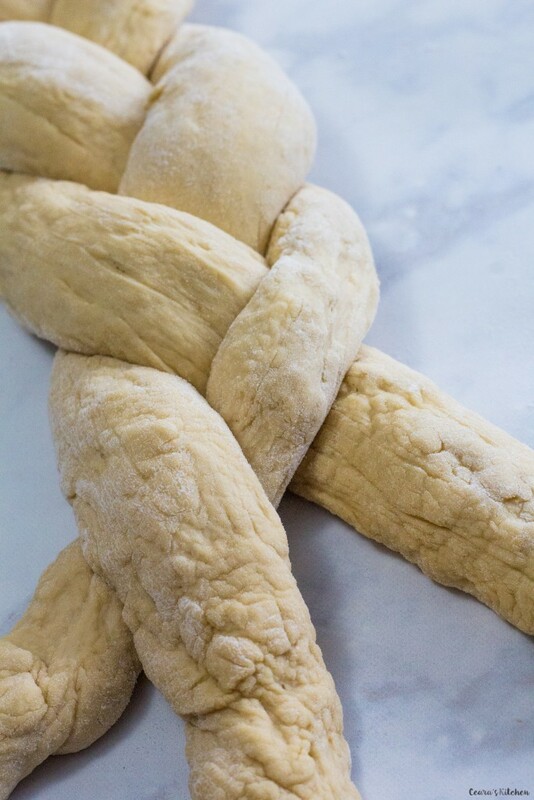 Press the ends of the dough together to seal them with a pinch of water and braid the dough until you have a one long dough braid. 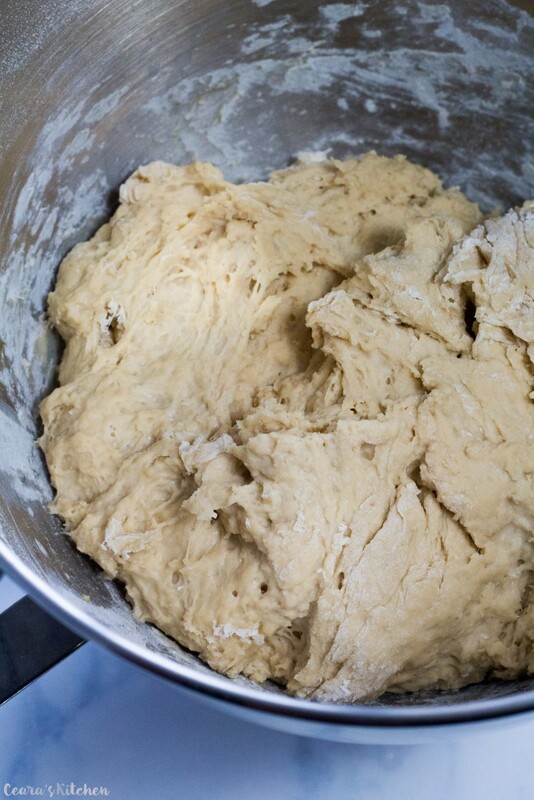 Bring the two ends of the dough together into a circle and press them with a pinch of water to seal the ends together. Transfer to the braided dough to a lined baking sheet. Cover with damp dish towel and leave to rest for 10 minutes. [b]Sugar wash:[/b] Preheat the oven to 350F. Combine applesauce, sugar and coconut oil (or aquafaba) together into a small bowl. Microwave for 15-30 seconds until the mixture is warm and melted. Whisk together and lightly brush the dough with sugar wash.
[b]Bake: [/b]Bake for 40-45 minutes until the crust of the bread is golden brown. Remove from the oven and brush the warm bread with the applesauce mixture. Sprinkle with sugar. Leave to cool for 15 minutes. Serve warm with jam, nut butters or by itself! 1) For this recipe to be completely [u]oil-free[/u] use aqaufaba instead of coconut oil in the sugar “egg” wash. Also, omit the non-stick cooking spray. [br]2) If you do not have a mixer you can mix the dough using a large mixing bowl and wooden spoon. [br]3) You can also make this dough the night before. Prepare the dough and instead of leaving it to rise in the warm oven, cover with plastic wrap and leave to rise in the fridge overnight. Hi! Thanks for this recipe! Do you think spelt flour would work ? I have experimented with gluten free flour and needed to add a touch of oil and bit more milk as it was too dry but gluten free recipes often need more liquid. It’s proofing at the moment so am hoping it’ll bake well and taste good. I also added all spice and raisins for am Easter flavour. If it works I’ll let you know. Let me know how it turns out! Enjoy! I’d love to have my challah back! So thanks for this. 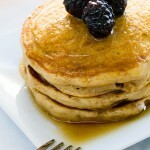 Would whole wheat flour work? Hi there just wondering if this recipe can be made gluten free by subbing different flour or if it would change the recipe too much? Thanks! 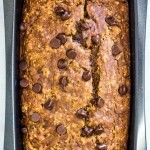 I made this for my son who can’t have dairy or eggs, added cinnamon and nutmeg and it was so delicious. Hi. You seem to have started out using a stand mixer to combine ingredients, but then switched to kneading by hand, instead of kneading in the stand mixer, Could you add kneading directions if using a stand mixer? How long, what speed? You can knead by hand or with the dough hook in the stand mixer. Knead on low for 5 minutes until the dough turns into a ball. I still like to knead by hand for a minute of two after using the stand mixer as well to get out any air bubbles. I have it in the oven now, It smells so good. I left off the sugar wash, as I did not want the extra sweetness. I lightly brushed the bread with water and sprinkled on poppy seeds before baking. As much as I will want to dig into it. as soon as it comes out of the oven, I am saving it for company tomorrow. What is the best way to wrap it to keep it fresh?